As the day of her wedding draws ever closer, Pippa Middleton's to-do list is likely to be extensive. But the bride-to-be, who will marry her financier boyfriend James Matthews at her local village church in Berkshire in the spring, still found time to surprise heart patients by dropping into a charity afternoon tea in Belgravia in London. 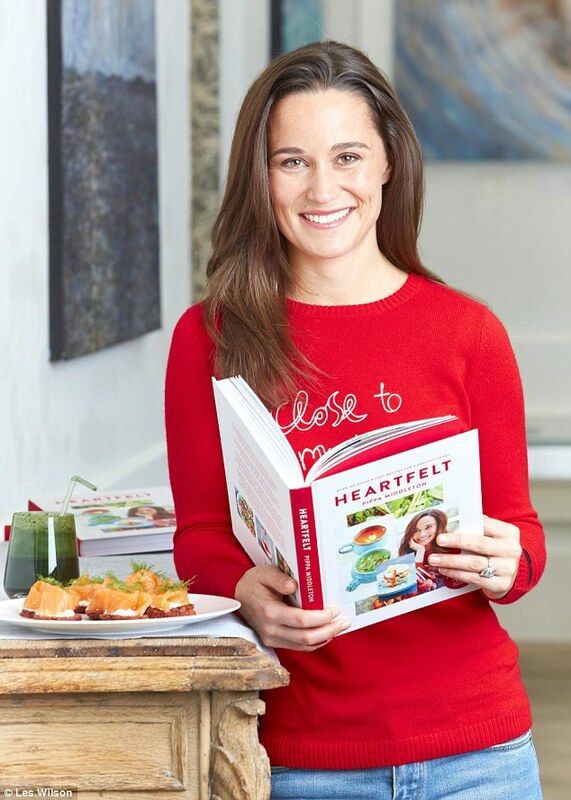 The British Heart Foundation ambassador was a surprise special guest at the Charing Cross support group's tea on Sunday, where guests enjoyed beetroot falafels and oaty drop scones taken from Pippa's new 'heart healthy' recipe book. In the winter months it can be tempting to stick to blacks and greys to reflect the mood of this rather gloomy season. But why not brighten up your wardrobe, and your winter, with vibrant hues that'll be sure to give even the darkest of days a pop of color? Pippa Middleton has done just that in an eye-catching look by Tabitha Webb. 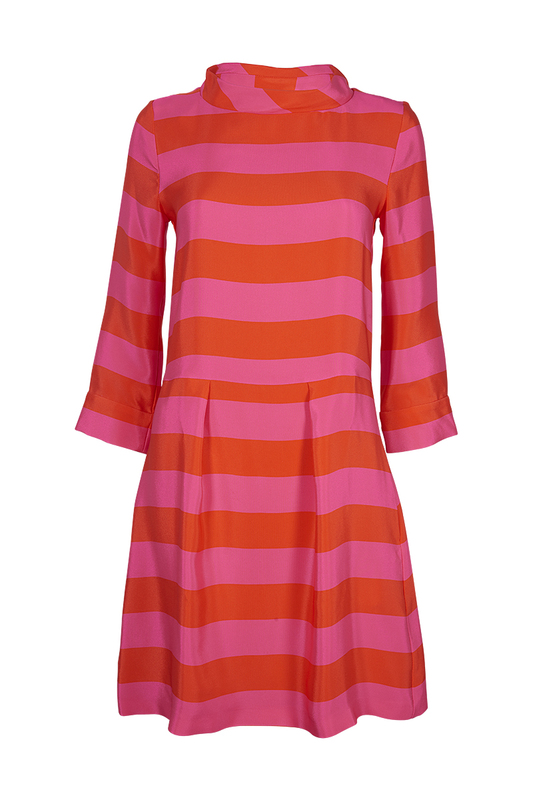 This designer is one of Pippa's favorites and she's bagged herself a bespoke version of the label's 'Edie' striped dress from the current collection. 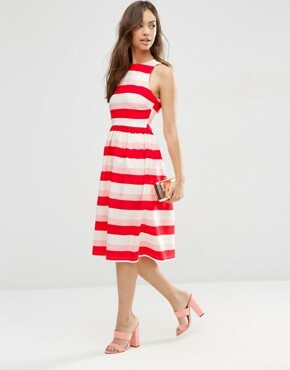 We love the clashing combination of red and hot pink as well as its long sleeves and flippy skirt. 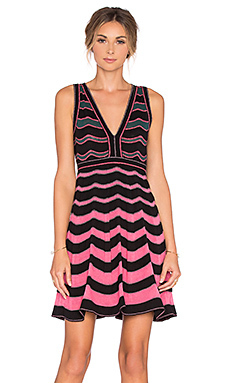 If you do too and you fancy ditching the LBD this Christmas then click (right) to buy the ready-to-wear version now. 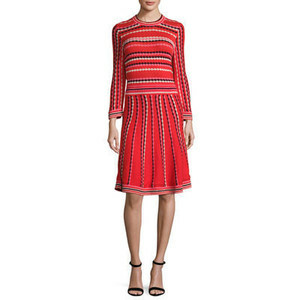 Style with courts to nail Pippa's demure look and you'll be good to go. Members of London Heart Support Groups sampled dishes from the 33-year-old's latest collaboration with the BHF Heartfelt, a book featuring more than 100 recipes that are ideal for maintaining a heart healthy lifestyle. 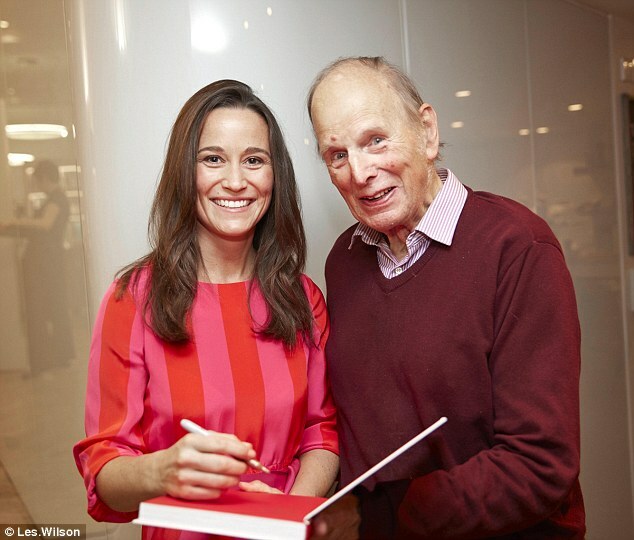 'The determination and energy in the room was inspiring,' said Pippa of her surprise visit to Grace Belgravia. 'As an ambassador, I care deeply about the work of the British Heart Foundation. 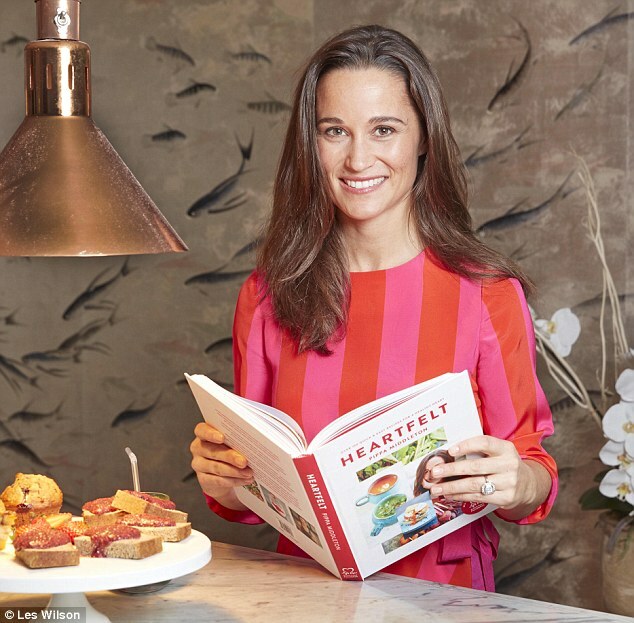 Pippa was seen mingling and chatting to guests at the health club Grace Belgravia, where guests enjoyed dishes like salmon topped spelt and beetroot blinis and banana, blueberry and oat muffins. 'Through Heartfelt I want to demonstrate how easy it is to create simple dishes that help with nutritious eating and focus on nourishing meals which are good for the heart,' she said. All of the proceeds from the book are being used to help fund the British Heart Foundation's research into fighting coronary heart disease. Eileen Hunt, who attended the tea, said: 'I had such a wonderful afternoon. 'Having Pippa there and getting to sample some of the tasty dishes was such a wonderful surprise and a lovely treat. The Heartfelt recipe book is available from British Heart Foundation shops or on Amazon for £19.99.